You can also submit feedback directly to: info@IP-Cambridge.co.uk. 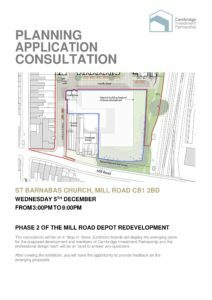 At the Mill Road Depot consultation in December 2018, PACT learnt that their design requests for the Gatehouse Community Centre on the depot site had been heard, and we feel the design now being submitted for planning approval is excellent and will serve the community well now, and into the future. PACT would now like to invite you to a meeting to bring you up to date and discuss any ideas you might have, as the location of the community centre will not only benefit the whole of Petersfield, but also the wider community. To this end, there will be a meeting at The Salvation Army Community Centre, 104 Mill Road CB1 2BD (next to St Barnabas Church) on Tuesday 26th March at 7.30pm. Thanks for helping to keep us aware of the plans as they emerge. Next Next post: Hooper Street chestnut trees – Result!